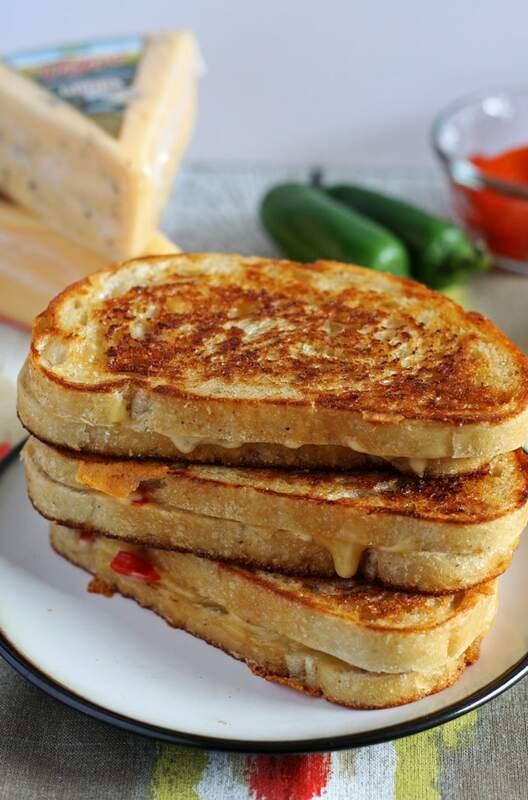 Turn a kid-friendly classic sandwich into an adult masterpiece with this recipe for a gouda jalapeño roasted red pepper grilled cheese sandwich! I love a good grilled cheese sandwich. There is something about gooey melted cheese that makes me all warm and fuzzy inside. Thank goodness April is National Grilled Cheese Month and I’m celebrating with Arla Dofino! I was going through my recipe archives the other day and I realized that I have never shared a grilled cheese recipe of my own. Obviously, that is a problem with an easy solution. As a kid, I ate a lot of grilled cheese sandwiches. I think a lot of kids did – it’s one of those classic foods and it is kid-friendly. Well, I’m not a kid anymore and I want a grilled cheese sandwich that is more than white bread and yellow cheese. I started with good bread and delicious cheese, like the naturally good cheeses from Arla Dofino. Arla Dofino cheeses have been traditionally crafted in Wisconsin for more than 100 years. The cheese is free of added hormones, artificial flavors and preservatives, and crafted with quality, natural ingredients. Also, it tastes really good! 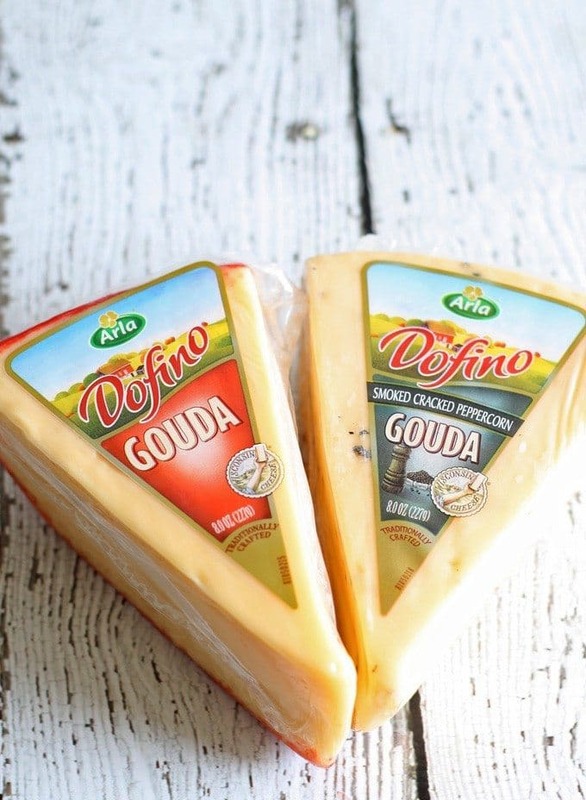 I chose the Arla Dofino gouda for my grilled cheese recipe. It’s buttery, creamy and oh, so delicious. Then, things get crazy – I added spicy jalapeños paired with smoky roasted red peppers. I figure if I am turning a kid-friendly food into an adult-minded sandwich, you need to add adult flavors. I bought a wedge of gouda instead of slices, so I shredded it which I have found makes it melt pretty well. Then its time to get cooking. Start will two pieces of well buttered bread and a hot pan or skillet. Place one piece of bread, butter side down, on the pan. Sprinkle the shredded gouda evenly on top of the bread, being careful not to spill too much cheese on the pan. Put the jalapeño and roasted red pepper on top of the cheese and then sprinkle some more gouda over that. You can never have too much gouda. Then place the second piece of bread, butter side up, on top of the cheese. Use a spatula to push down on the bread so the cheese and ingredients all stick together. When the bottom piece of bread is toasted, carefully flip the sandwich over and cook the other side. 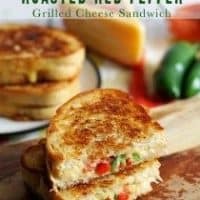 Before you know it, you are going to have a melted, gooey mess of a delicious sandwich that you will want to start eating immediately. And you should. Cut it in half, and take a big bite when its cooled down just a little. Enjoy! Evenly butter the bread slices on one side each. Heat a pan on medium heat. When the pan is hot, put one slice of bread on the pan, butter side down. 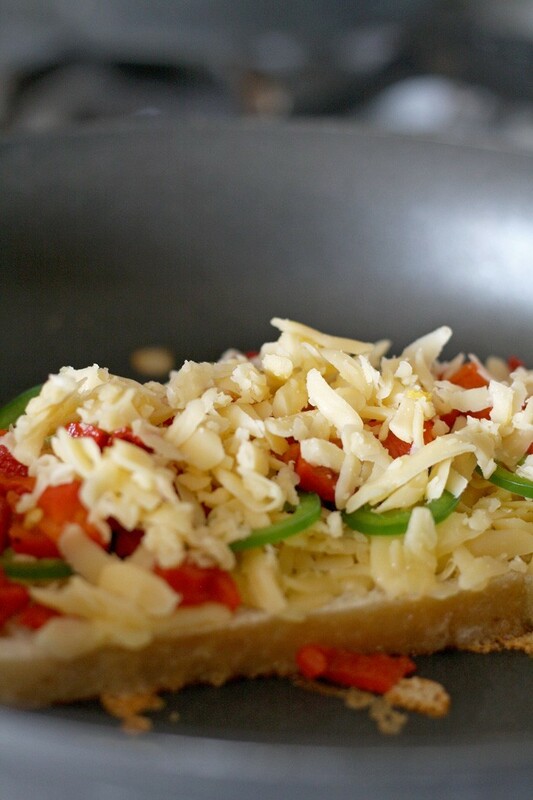 Put the cheese on the bread, then sprinkle the red pepper and jalapeño over the cheese evenly. Place the other slice of bread on the cheese, butter side up. Cook slowly, until the bread browns and the cheese melts, about 3 minutes. Carefully flip the sandwich over and cook the other side for about 2 minutes. Remove from pan, cut in half. Thank you to Arla Dofino for sponsoring today’s post and inspiring me to try their naturally delicious cheese! 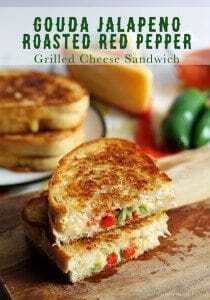 I love grilled cheeses and I love them even more with extra yummy ingredients like this! And that gif, I’m drooling!! Thanks Michelle! I can’t resist making gifs if I have the right sequence of photos! Yum!!! I love grilled cheese sandwiches too! Looks delicious! Isn’t grilled cheese month a great idea? A great way to find some tasty-looking recipes. I love a bit of a kick added in there, so this looks up my street. These look amazing! So incredibly gooey! Oh my word ! This looks fantastic, Jenny ! And all that gooey cheese ! Thanks Linda! It was super gooey, and I had to photograph it! I love your addition of roasted red peppers to this sandwich. It adds a great pop of flavor AND color. Goal accomplished! 😉 Thanks Danielle! Lol, Jess, I will add you to the waiting list. this looks amazing.. I love a good grilled cheese!! 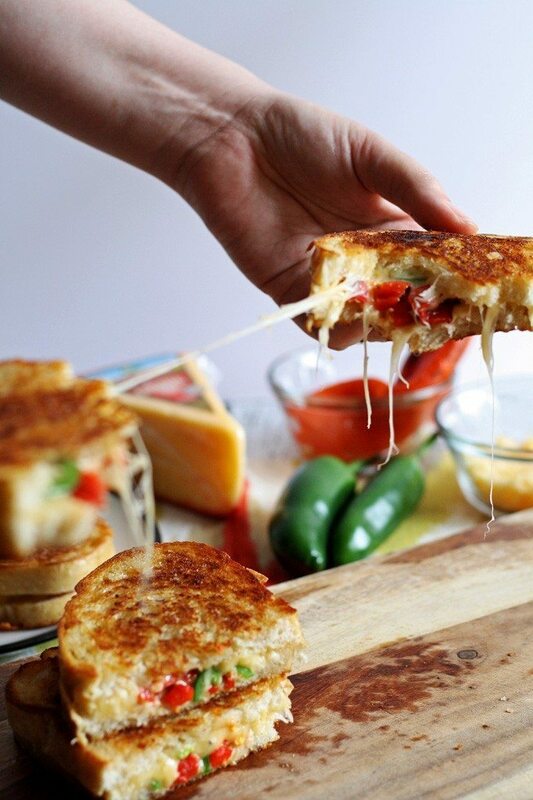 Mmmm I love Gouda and Jalapenos! Oh my goodness, those look amazing! I’ve never thought about shredding the cheese. I’m definitely putting this on the menu. Thanks for sharing. Thank you Lisa! I love how the cheese melts when it’s shredded. Thanks Dee! Gooey grilled cheese sandwiches are my favorite.